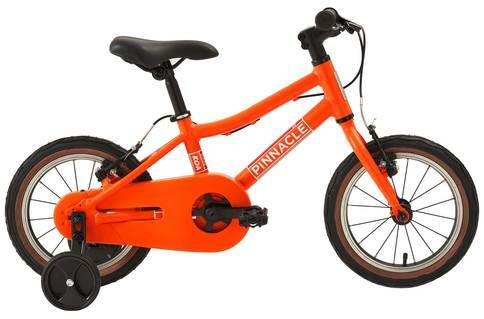 Pinnacle Koa is an excellent bike model for children aged between 4 and 6. These bikes are made simple to make riding fun for small cyclists who are still learning the art. The bikes have nice features as well, like chain guards. Also, these bikes are amazingly durable. Pinnacle Koa is a kiddie bike model. These bikes are best suited for children aged between 4 to 6 years. This is the age range when most kids graduate from training wheels to proper bikes. Koa is a good model the get your child started on. These bikes are appealingly designed for children. The frames come in vivid colors like fire orange that kids will immediately love. Some bikes in this model also come with gimmicks like stickers or police logos that appeal to most kids. We have several starter bikers review this model for us. This is a beginner pedal bike model that comes with stabilizers. Conveniently, the stabilizers can be removed if needed. The chainset is single speed, which really simplifies riding for kids. Also, the chainset has a chain guard. This will prevent the parents from having to end up with greasy hands every time the kids go out for a ride. The bikes of course have a grab rail so parents can give a helping hand. The bikes come with 1.75 inch tires. These tires are not huge, but are intended to roll well on grass, parks, sidewalks, and tarmac. We were impressed by the quality of the bearings on Koa bikes. The bearings prolong the shelf life of the bikes so younger siblings can one day use the bikes too. As for drawbacks, the brakes did not impress us. Also, the price could be lower considering it’s a kiddie bike model. It’s really hard to find a good bike model for children who are transitioning out of training wheels. This is where Pinnacle Koa bikes come in. These bikes are suitable for 4 to 6 year olds who just want a simple and fun ride. There are features parents will like too, like chain guards and grab rails. We highly recommended this model.